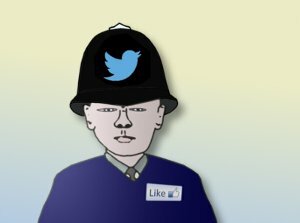 Police forces in the UK are reporting a significant increase in detection rates after turning to social media in order to catch criminals. Last year, a pilot project by Cambridgeshire Constabulary experimented with friending suspected offenders on Facebook, successfully managing to track down a number of wanted felons from pictures of their pets. The project has now been expanded across the country as senior officials have realised that it is both cheaper and safer for surveillance officers to follow people on Twitter rather than in real life. Not only that, but there are rumours that Google Plus is developing a function that will enable law enforcement agents to arrest people online, while Pinterest is experimenting with software that claims it can reliably extract a confession. Inevitably, the move towards virtual policing is attracting its critics, but proponents of the new measures are keen to highlight success stories. For example, there was a great deal of press coverage when the Serious Crime Squad cracked a major international counterfeiting ring after connecting with the ringleaders on LinkedIn. But this news was soon eclipsed by an even bigger breakthrough: namely, the arrest of a wanted post office robber who was finally discovered after hiding out - completely unnoticed - on MySpace for the last ten years.